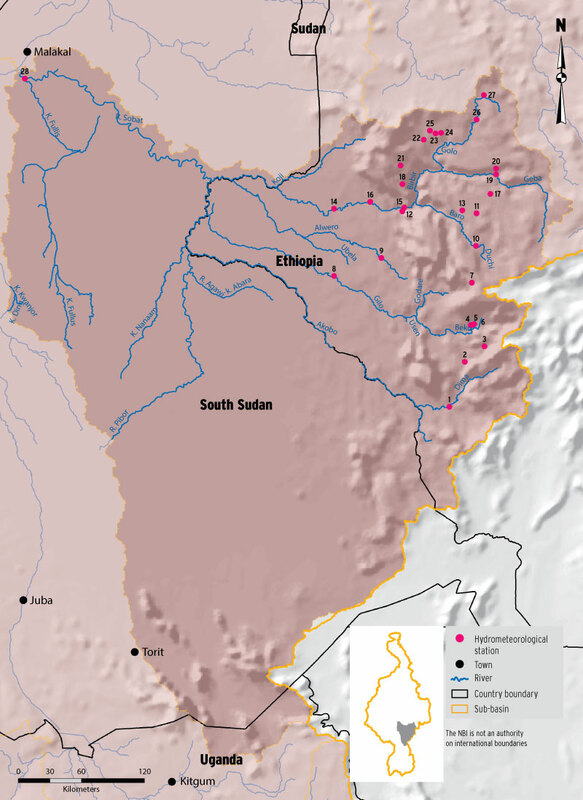 The Baro-Akobo-Sobat sub-basin is shared by Ethiopia and South Sudan. Its major rivers are the Baro, Akobo and Pibor. The Baro, after joined by Akobo and Pibor makes the Sobat that flows to the northwest to join the Bahr el Jebel and eventually form the White Nile. The annual water yield of the Sobat is approximately 12- 13 x 109 m3. The reach of the Baro and Sobat downstream of Gambella town (in Ethiopia) is navigable. A key feature of the hydrology of the sub-basin is that its rivers (especially in the lower reaches) flow over flat surface with meandering patterns creating complex interactions with surrounding floodplains. The spill from the Baro river into the Machar marshes (in the White Nile Sub-basin) is one of naturally occurring transfer of water into a neighboring catchment. There are 78 meteorological stations in the sub-basin – all in Ethiopia. The distribution of the stations is shown in the map below. 17 stations are reported to measure the full range of meteorological parameters. Most stations are in the highlands with very few of the stations located in the lower plains of the sub-basin in Ethiopia. 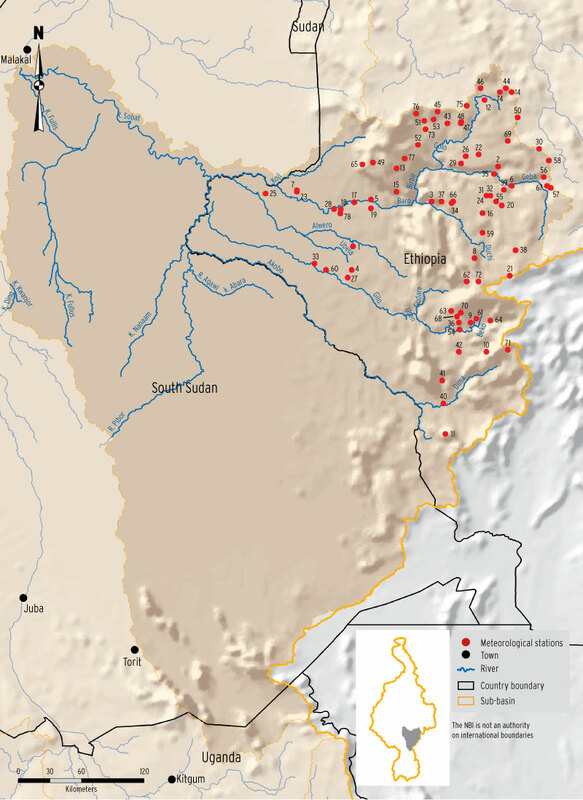 There are 28 stations in the sub-basin (27 in Ethiopia and 1 in South Sudan). More than half of the stations in Ethiopia were established in 1980’s and, therefore, have short records. Breaks in records often pose additional challenges in using such short records. The hydrometric network of this sub-basin is far from adequate. The sub-basin, especially in its lower reaches exhibit highly complex hydrology in which the rivers at time bifurcate and join back the main stem and floodplains and swamps interact with the river flows. The Hydrometric network in this sub-basin requires strengthening with additional data collection through remote sensing to adequately understand the hydrology of the sub-basin.